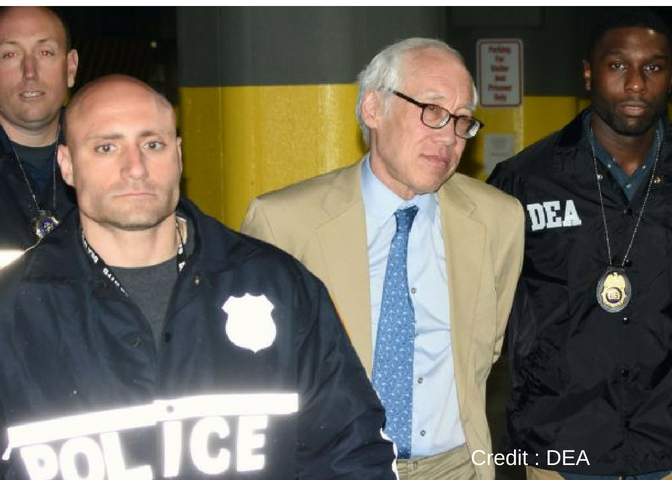 A Queens doctor is facing hundreds of charges for his care of patients, including reckless endangerment, over prescribing and homicide. The licensed internal medicine physician, Dr. Lawrence Choy, 65, has been accused of a total of 231 charges, 200 of which were criminal counts of sale of a prescription for a controlled substance. Defense Attorney John Martin argues the doctor was just doing what he believed was right, despite the three patients who died from overdose under his care between 2013 and 2016. In all he has been charged for giving illegal prescriptions to 14 patients. Choy is being charged for the manslaughter of patients Micheal Ries, 30, who died of an overdose in March 2014 and Elliot Castillo, 35 who passed the same way in February of 2013. Another patient Dan Barry who died in January of 2016 is being charged as an act of reckless endangerment. During a news conference with federal and state officials, city special narcotics prosecutor Bridget Brennan said that over a 5-year investigation, it was revealed that since he became licensed in 1981, he worked in various medical fields until he switched to pain management following a 2012 back tax bill owed to the government to the tune of $1 million dollars. Once he began his pain management practice he began issuing large amounts of prescription pain medications, some actually had legitimate pain issues. The ease of obtaining large amounts of prescription got around, and his practice grew. In lieu of responsible prescribing, Choy allegedly prescribed the drugs for his own profit at the risk of his patient’s lives. Investigators explained, “As word got around that he was pretty easy to give prescriptions, people came to seek prescriptions in exchange for cash,” said Brennan. He estimated the doctor made hundreds of thousands from his over prescribing practice. Patients then had enough pills to keep for themselves, and sell on the streets to make a profit and pay for their doctor visit, as opioid medication can fetch up to $30 a pill. He was known for prescribing what is known on the street as the “Holy Trinity” of medications, which includes opioid pain medication Oxycodone, the anxiety medication Xanax and muscle relaxer Soma. The combination is known to be a fatal concoction, which shows a callous disregard for the patients well being. “Both (Xanax and Oxycodone) drugs have the effect of suppressing respiration and when taken together are known to heighten the risk of overdose deaths,” Brennan said. Choy was found to receive reports of the patients’ involvement in accidents, participation in drug treatment programs and prescriptions they received from other physicians, and despite his knowledge of this information he still continued to prescribe the medications. He was known for prescribing the medications in inappropriately high doses and pill counts. He continued by comparing illegal diversion of prescriptions by doctors on the same level as drug kingpins. “After 30-plus years in law enforcement I never thought I’d see the day where major drug dealers and doctors would be interchangeable in DEA investigations,” he said. Authorities became alerted to his prescribing habits when a high amount of prescriptions were being filled in pharmacies as far away as Pennsylvania and New Jersey, when the prescriptions were written from Choy’s Queens office. During the time he was under investigation, the DEA claims Choy became suspicious and abruptly abandoned his practice and moved to Sheboygan, Wisconsin where he was followed and arrested last March. He is behind bars as of now, but the judge overseeing the case said he will consider a bail package when the defense attorney comes up with one. He is set to return to court this coming Thursday.